This morning I had a great discussion with a couple of peers around an issue that came up with a new feature we’re developing. The issue was that clients could attempt to delete something that was in process, midstream. The initial idea to negate the problem was to throw up an error message telling the user that it was too late to delete the job. From a UX perspective, we decided this could cause our users frustration, and a feeling of lack of control. After tossing around some other ideas we settled on just removing the delete button from the screen entirely during processing, rather than throwing an error message. When you have the opportunity, rather than throwing error messages, think outside the box and look for solutions that will keep users from being able to trigger the errors in the first place. Small UI tweaks can make a huge difference in UX. Even small negative interactions with your product can have a big impact on customer satisfaction. 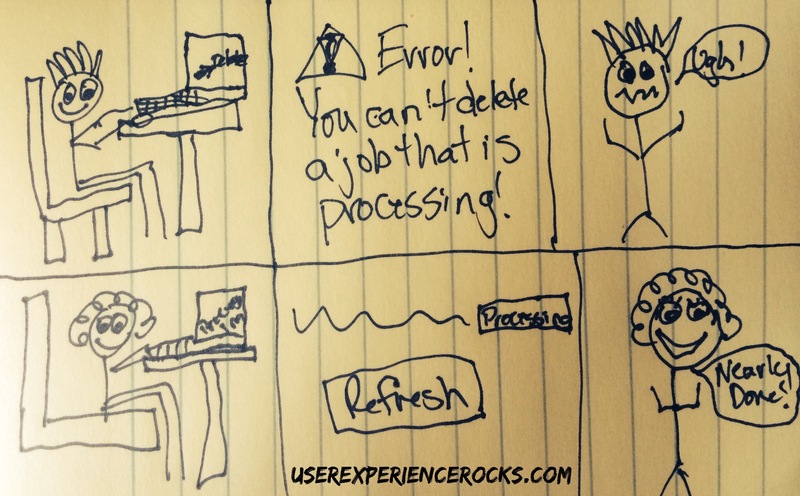 By negating errors your UX will rock, and your users won’t associate using your product with feelings of frustration. It’s a win/win situation.